Please refer to our stock # 9805 when inquiring. 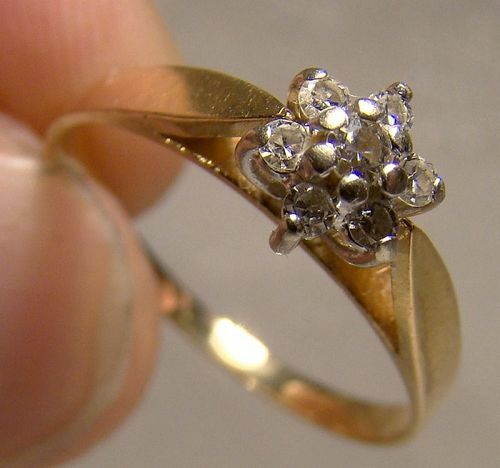 A 14k yellow gold 7 diamonds cluster ring from the 1970s. This (just slightly under) size 7 ring features a flower head style diamond cluster with six claw-set 2 point diamonds (the center is ~3 points). The setting is 1/4" across, the ring weighs 1.7 grams and it is stamped 14K with an S in G maker's mark. It is in excellent condition with no chips, cracks, dents, bends, corrosion, damage or repairs. All items are thoroughly and conservatively graded and all condition issues are noted; all items are vintage or antique and may have slight signs of gentle use. Expedited tracked and insured parcel shipping to the U.S. starts at $21 (other spots may vary, air is higher). Items paid with a credit card will be shipped to confirmed addresses only. We do ship internationally. All of our prices are in $US. PLEASE NOTE: We DO NOT accept PayPal.